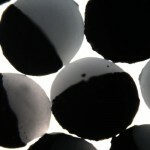 Cospheric offers unique capability to manufacture Janus microspheres and micro-particles with partial coatings and dual functionality. Currently half-shell or hemispherical coatings can be applied to any sphere (glass, polymer, ceramic) in sizes 45micron in diameter on up to 1mm and higher. 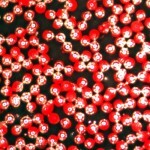 Hemispherical coatings of less than 1 micron with tolerances as low as 0.25 micron have been routinely demonstrated. Color combinations are truly unlimited. White, black, silver, blue, green, red, yellow, brown, purple in both fluorescent and non-fluorescent have been made. Sphericity of greater than 90% and custom particle size ranges are offered. they work ideally as fluorescent tracers or highly visible targets. We can overcoat clear glass or silver coated glass for the effect needed. For those needing very large Spheres Cospheric can coat spheres of 1mm and larger. Janus microparticles are now available as either dry powder or in a diellectric oil.